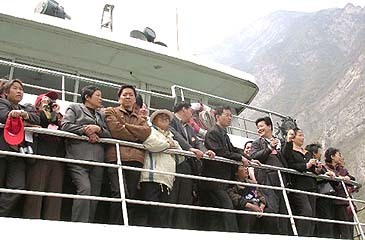 Chinese tourists on the boat watching the scenery. Asia Pacific, more than any other region in the world, will benefit from the booming Chinese outbound tourism market, which is set to grow by 18% in 2007 alone, according to global market analyst Euromonitor International. The number of Chinese tourists travelling abroad is on target to reach 80 million by 2011, driven by rising disposable income levels in China and the expansion of the approved destination status list. Euromonitor forecasts that five destinations within Asia Pacific are set to dominate the Chinese outbound tourism market, with Hong Kong, Macau, Vietnam, South Korea, and Japan predicted to take a massive 85% of all Chinese outbound tourist numbers by 2011. While Hong Kong and Macau have long-been popular destinations for Chinese tourists, it is Vietnam and South Korea that will top the table in absolute growth terms over the next five years, increasing their Chinese visitor numbers by 21% on average each year between 2007 and 2011, according to Euromonitor. The popularity of Asian destinations for Chinese tourists is largely a question of price sensitivity and familiarity, according to Farzana Mohsin, Asia Pacific Research Manager at Euromonitor International, who is speaking about the boom in Chinese outbound tourism at the Travel Distribution Summit Asia 2007 being held in Singapore. "Chinese consumers prefer familiarity while on holiday in terms of food, customs and having Mandarin language translations for brochures, websites and other textual materials," said Mohsin. "Destinations close to home within the Asia region are not only cheaper to get to, in less time, but they are also perceived to be more in-line with the Chinese way of life, while conversely, many destinations in further a field regions, such as Europe and North America, seem ill-equipped to appeal to Chinese tourists, lacking for example tour guides, websites or guide books which offer Mandarin translations. Indeed, France is the one country in Western Europe that stands out from the crowd in terms of its efforts to target Chinese consumers." Hong Kong's established popularity with Chinese tourists is not simply the result of its proximity to the mainland, but it is also thanks to its bountiful supply of shops, with shopping for luxury brands, as well as bargains, coming in as the most popular activity for Chinese tourists while on holiday. Shopping currently accounts for 38% of Chinese tourism expenditure, however, Euromonitor predicts that this figure will to rise to 40% by 2011 as Chinese tourists make a beeline for countries that offer a good range of products which are esteemed back home. Other destinations in Asia which Euromonitor suggests are well placed to tap-into this shopping craze include Singapore and Japan. To sustain their share of the Chinese outbound tourism market, Asian destinations need to keep apace with economic and demographic changes within the Chinese market. By 2011, for example, 20 to 34 year olds in China will have the highest average income and will account for over 30% of total income earned in the country. This new target group will present a different set of challenges for destinations trying to appeal to Chinese tourists. Younger, internet savvy and likely to be well-educated with a wider knowledge of world current affairs, culture and history, Chinese tourists aged 20-34 will require different targeting techniques to their older, traditional counterparts. "The challenge for destinations, within and outside of Asia, will be to decide which target group in China is more lucrative and which should be their primary focus. The alternative, perhaps more difficult option, would be to find a way to appeal to all Chinese consumers to maximize tourism revenue potential from China" Farzana Mohsin added.